I love a good knockoff. It always makes me feel like I’m saving tons of money. 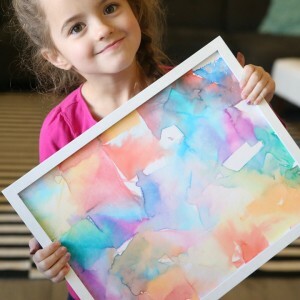 The fact that I’d never spend all that money on the pricey original in the first place doesn’t matter one bit – making my own version for way less is still pretty fun. 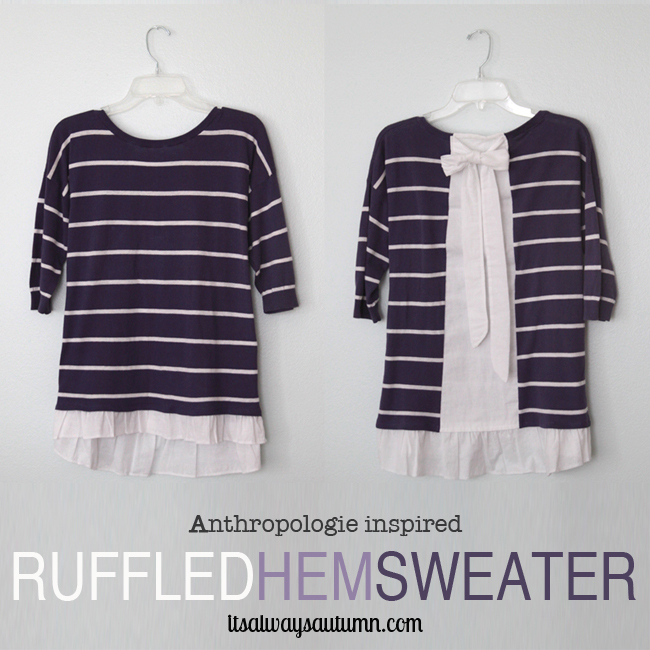 I was able to construct a knockoff of Anthropologie’s ruffled hem pullover for $80 less than the retailer charges. I’ll be the first to admit my version isn’t quite as luxe-looking as the original, but hey, it cost 8 bucks! I’ll take it. 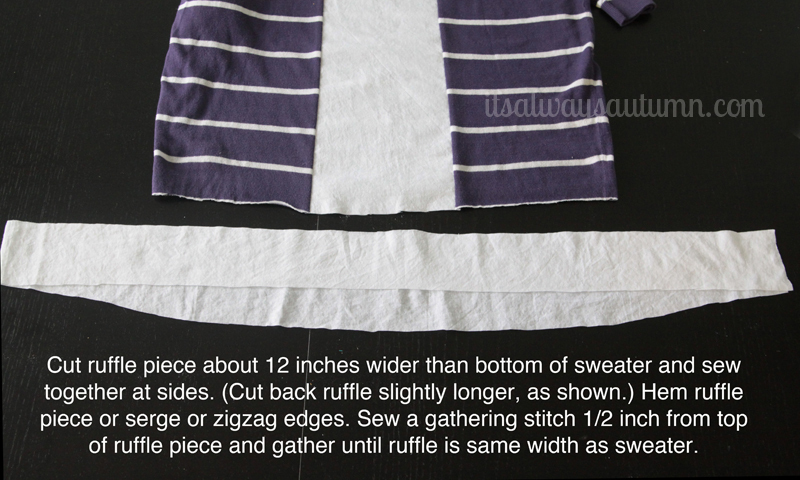 If you’d like to make a ruffled hem pullover, you’ll need a lightweight sweater and about half a yard of another lightweight fabric. I used a very lightweight muslin that was 108 inches wide – with a coupon 1/2 a yard came to less than $3. If you use a different material that’s only 45 inches wide you may want a full yard. 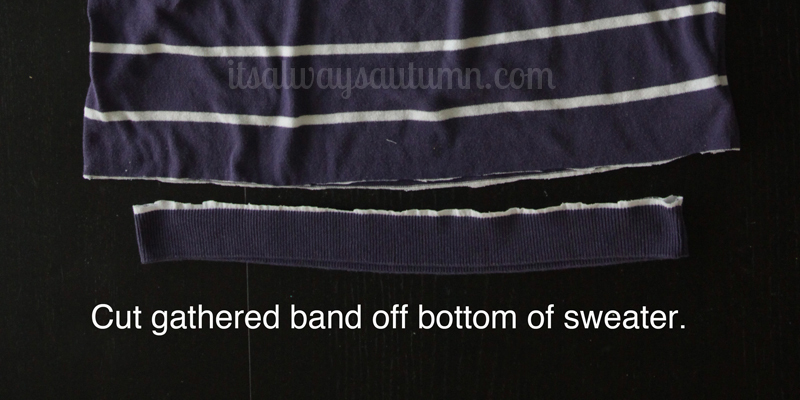 Be careful when sewing the white panel into your sweater that you don’t stretch the sweater. A long stitch length will help. 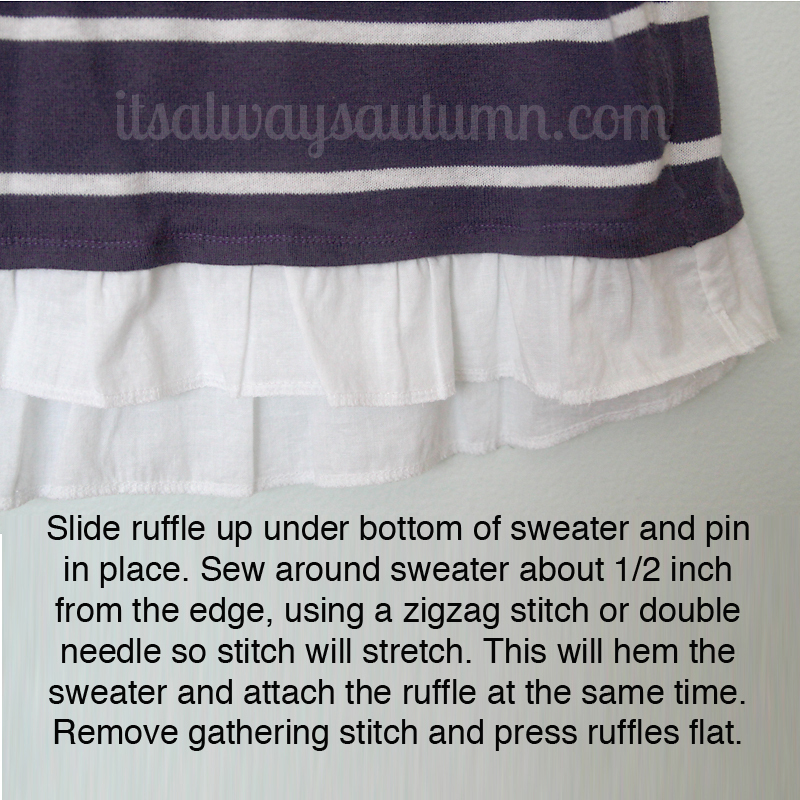 Now we just need to add the ruffled hem. If the sweater gets a little stretched out along the hem just press it with a lot of steam to help it shrink back to it’s normal size. That’s it! New life for an old sweater. I love it!! 🙂 You so talented Autumn!! Nagyon tetszik és ötletes megoldás – egy puloverből oriási megoldást alkotott. I love it and ingenious solution – created a giant puloverből solution. I have a sweater that is too tight I might try this with. 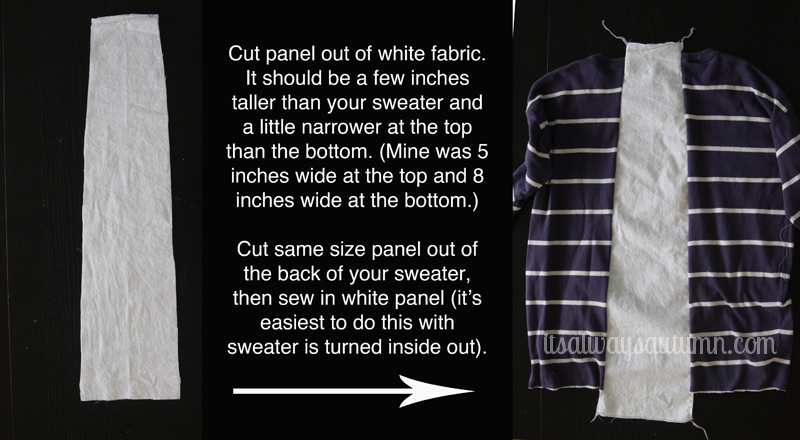 Instead of cutting out fabric from the sweater I will just cut it open and expand it with the white. Can’t wait to try all your good ideas! 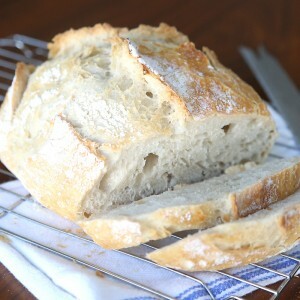 I like quick and inexpensive! I just found your site! thanks for sharing all your knowledge and learning nuggets! I too measure projects in length of nap time, so i think I will find myself on your site often! Love this knock off, great job! You did a great job! I like it. Yours is nicer that the original! Thanks for sharing your ideas. 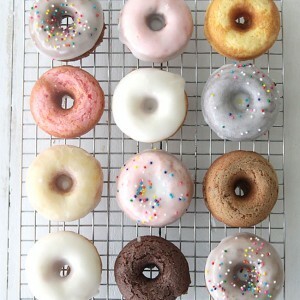 Yours is nicer than the original! Thanks for sharing your ideas. I, too, say that yours looks better than the original! 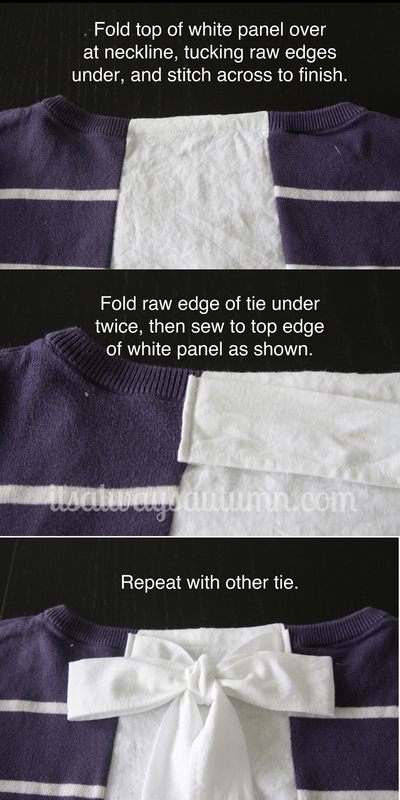 A great way to create a new look out of a sweater or one that is too tight. I love this!!! But I am new to sewing and I am trying to make a practice sweater and I can’t figure out how to sew the back without stitching the other layer. Do you have any tutorials on that or can offer any advice? 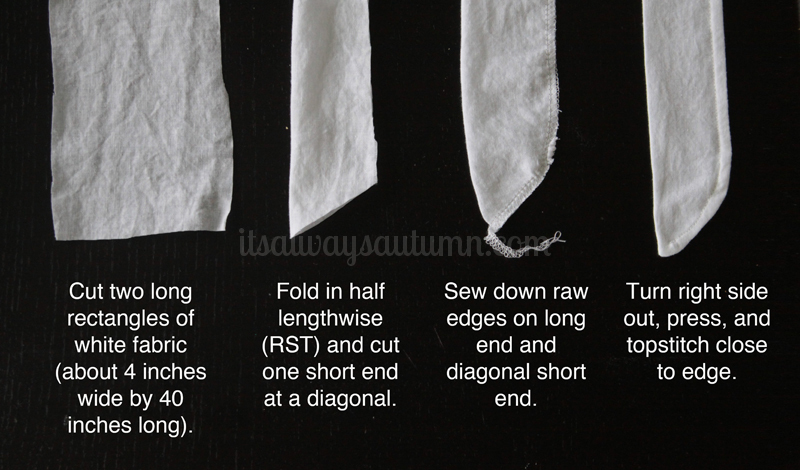 Something that would give it that super tailored look would be to have the ties sewn first then slide them between the fabric panel and sweater front.If you want a ultra feminine look use a Victorian colored sweater, cream or soft white panel trimmed with lace at the hem. Of course this would be more $$ but if most sewers are like I am they will havlace around some where. If you wanted to make more than one ( gift?) Using a new flat sheet may be more cost effective. 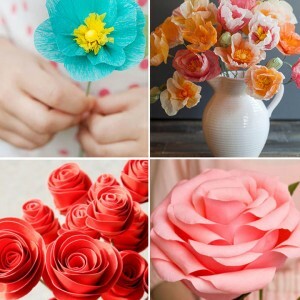 I just love all your sewing idea!